Choosing the "Send your issue to me" option is a quicker and more convenient way to get coaching for an issue that would require Steve's help, but does not require a full coaching session. "Send your issue to me" is all done by email and will not require additional forms to fill out unless you are a first time client. Returning clients will only have to fill out the online Purchasing "Send your issue to me" Coaching form and submit it back to us. From there you will you will be billed for the coaching services in advance by email. Once the forms are submitted and your payment is made you will get your "Send your issue to me" email response from Steve within 2 business days. 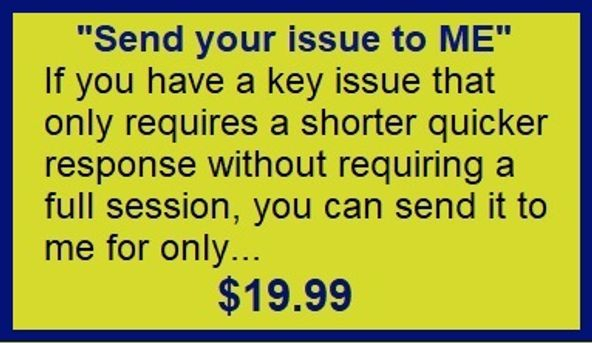 To do this just CLICK HERE which will take you to the Purchasing "Send your issue to me" Coaching page and fill out the online form. If you are a returning client, please don't forget to enter your Client Number on the form.